Tencel is part of a new age in fibre – it’s derived from eucalyptus plantation timber, so it’s considered a natural fibre that’s also anti-allergenic and friendly to the earth. Plus, it has a high moisture absorbency and dispersion, which helps you to sleep comfortably. And sleep comfortably you will, thanks to this Eco Renew Tencel Quilt, with its luxurious and soft Tencel fabric cover and heavenly high loft. 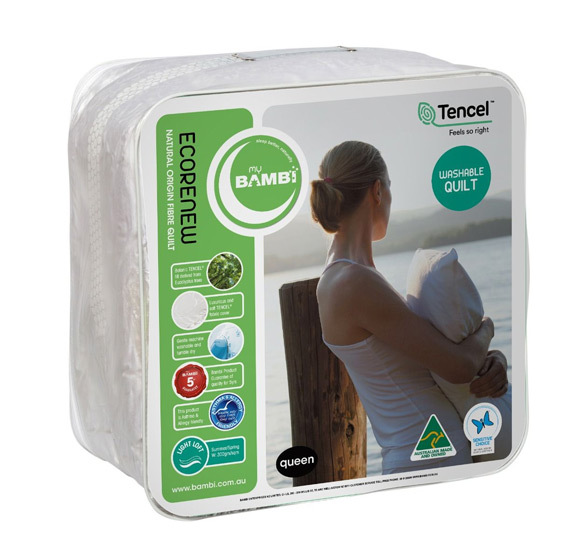 Perfect for autumn and winter, it’s even approved by the National Asthma Council of Australia, so just about everyone can fall asleep and in love with Bambi. Made with Tencel, a natural, earth-friendly fibre sourced from eucalyptus plantation timber. Luxurious and soft Tencel fabric cover. High loft of 430gm: suitable for autumn and winter. High moisture absorbency and dispersion helps you sleep comfortably. Approved by the National Asthma Council Australia.